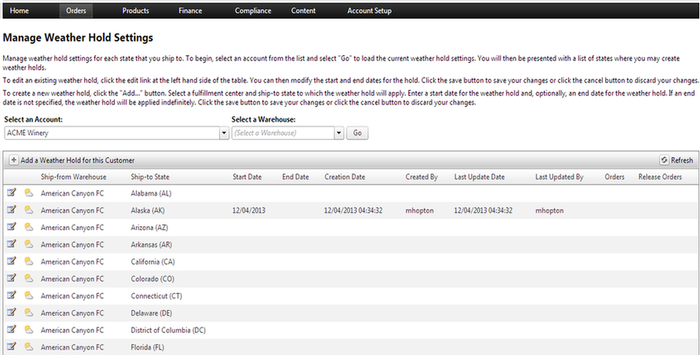 The Weather Management Tool on the WD Portal takes the guessing out of year-round shipping. You have the ability to place a particular order or the entire state on hold to await milder temperatures. View a map of the U.S. and all current local climates and forecasts. Place entire U.S. states on weather hold. Set a date range for any particular states' weather hold depending on the forecast. Review each order within a particular state, view its destination weather, and release orders going to milder climates. If there is enough inventory available for the products on held orders, the inventory will be reserved. Upon the end date, all orders to that state will ship. Once an order is taken off hold, it is reprocessed to ensure all the compliance requirements are still satisfied. Note: The state must be placed on weather hold before orders are in our system. If an order is in our system prior to the state being on hold, the option to move the order to weather hold isn't available. To begin, select an account from the list and click "Go" to load the current weather hold settings. You will be presented with a list of active and future-dated weather holds. To create a new weather hold, click the "Add..." button. Select a fulfillment center and ship-to state to which the weather hold will apply. Enter a start date for the weather hold and, optionally, an end date for the weather hold. If an end date is not specified, the weather hold will be applied indefinitely. Click the save button to save your changes or click the cancel button to discard your changes. To edit an existing weather hold, click the edit link at the left hand side of the table. You can then modify the start and end dates for the hold. Click the save button to save your changes or click the cancel button to discard your changes. Order holds can also be requested by entering a date in the “Do Not Ship Before Date” field. This is often used for consumers that have requested a future ship date because they won't be home to sign for the shipment. National weather informatoin is provided courtesy of www.wunderground.com. You can also remove a weather hold from your order details page!